Dental implants are becoming more popular as dentists and patients continue to see that the dental implant treatment is highly successful and predictable. Dental implants are mainly made of titanium and resemble small screws that are inserted into the jawbone. Dental implants feel like natural teeth as they are inserted into the jaw bone so are fixed and strong just like natural teeth. Implants were discovered and pioneered by Prof Branemark of Sweden. Dental implant treatments and designs have improved greatly in the last 20 years. Today we are able to replace teeth in just one day thanks for advances in immediate loading of dental implants. Dental implant treatment has been shown to be successful in more than 95% of cases. Dental Implants can be used to replace a single missing tooth or multiple teeth. Implants are also used to stabilize Removable Dentures. The treatment is relatively painless and usually takes 4-6 months to complete. A 44 years old male patient came to our clinic and complained of a failed fixed bridge on natural teeth. The bridge had been made 5 years before by the patients regular dentist. The teeth had been damaged before during a biking accident years before. The bridge was tender and had fallen off more than once. 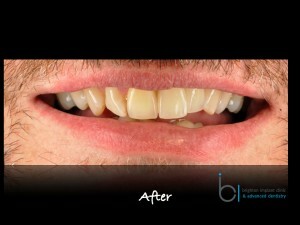 The patient was referred to our clinic for an assessment to see if implants could help with a fixed teeth solution. The bridge was of a standard porcelain fused to metal type and this meant that the margins were evident on the upper right central incisor and the upper left lateral incisor. The patients main request was for a stronger solution than the bridge and for a better aesthetic result. The patient was keen to replace the bridge with a long term permanent solution. The patient was seen for an initial assessment and once it had been agreed that dental implant treatment was the best long term solution the treatment began. The radiographs and ct scans confirmed that the upper left lateral incisor was fractured and needed to be removed. This was done gently under local anesthetic, and the area was left to heal. Following a 3 month healing period 2 dental implants were placed to replace the upper left central incisor and the upper left lateral incisor. The upper right central incisor was prepared to accept a new metal free crown in order to provide the best long term aesthetics. Metal free crowns have been shown to provide better natural looking crowns. 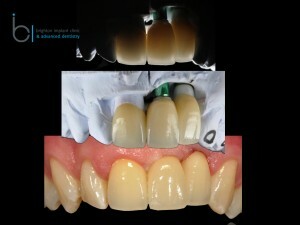 The crowns were made of a combination of Ivoclar Emax Ceramic and Zirconia. The metal free crowns allow natural light to pass through which means that the ceramic has very similar properties to natural dental enamel. This translucency provides highly natural looking aesthetic restorations. The translucency of the crowns can be seen on the upper image on the right side where light is shone behind the crowns. The Emax crowns are bonded to the natural teeth or zirconia abutments in order to provide a super strong restoration which can withstand the normal biting forces exerted on these teeth hundreds of time each day. 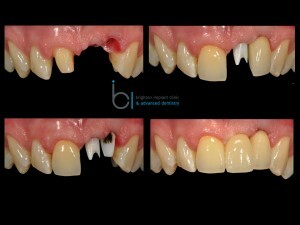 The patient was very happy with the final result. 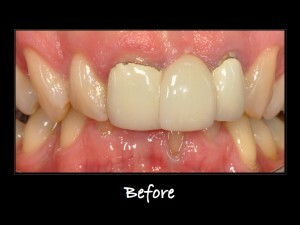 The treatment took 7 months to complete from start to finish. The patient is now able to smile with confidence and the teeth are more natural looking than the initial porcelain fused to metal bridge. If you have a similar problem and would like to speak to one of our dentist please feel free to Contact Us via our email contact form or via telephone 0800 111 6623. Brighton implant clinic is based in Sussex and has 3 branches in Brighton, Hailsham and Hove. Each of our clinics are designed and equipped with the latest technology and equipment. Our practices have been awarded prizes for Best New Practice and Most Attractive Practice in the Uk. Hi David, thanks for your enquiry, please could you let us know how we can help you. We offer a FREE initial consultation, which includes a full clinical report, radiographs and treatment plan. Please feel free to contact us if you need any further information. could you give me an indication of treatment costs please. We offer a FREE implant consultation which includes a full report, any necessary radiographs and treatment plan. If you need any further information please feel free to contact us. My daughter has no upper teeth and has just had new dentures that do not fit are very loose so cannot wear them and is reduced to wearing her old one’s .. They are loose too she has bone loss . which is the cause of this problem.Her Dentist says he can not do any more to help her. Also that an alighnment will not work. She is very distraught about this, it is making her very depressed. Hope that you can solve the answer to this sincerely Diane Hackett mother. Hi Diane, thank you for your enquiry. I’m sorry to hear that your daughter is having problems with her teeth. The best thing to do would be to visit the clinic and see one of our dentists for a free dental implant consultation. During this appointment the dentist could take necessary X-Rays and also a CT scan to assess the volume of bone in the jaw and discuss what options of treatment will be available for her. Please contact the clinic for further information or to book an appointment. I live in Milton Keynes , Can you give me your nearest clinic so I can get a consultation asap . Thank you for your enquiry, please see a link for the location of all of our clinics. If you need any more information please do let me know. Our first appointment is FREE of charge and will include all radiographs if required.